On the corner of Cermak and Prairie, clean concrete pillars sit inside the unmistakable bowl of an arena in the making. 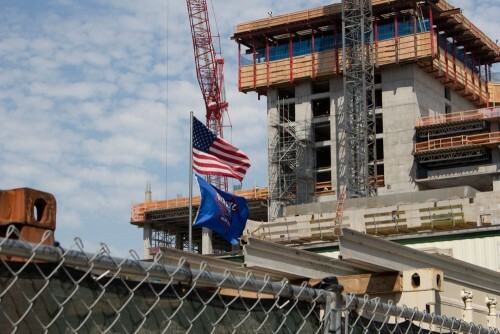 The U.S. and DePaul flag — both red, white and blue — whip against the metal of a flag pole high above unfinished walls. After almost a decade, the long-awaited 10,000-seat home of the DePaul Blue Demons shows its first signs of progress. 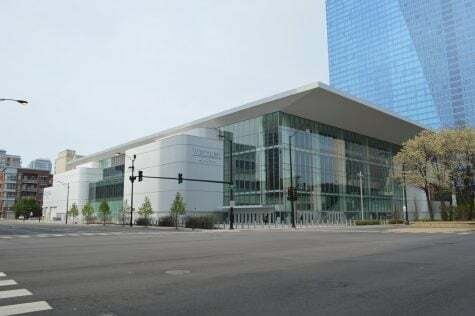 Since announcing their partnership with the Metropolitan Pier and Exposition Authority (known colloquially as “McPier” for its management of Navy Pier and the McCormick Place), DePaul has said that its stadium would more or less pay for itself. 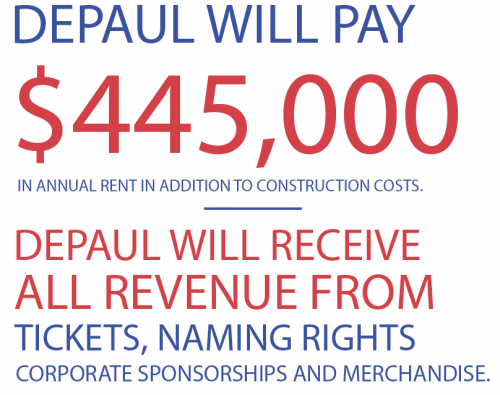 And as construction hums and deadlines loom, DePaul is prepared to write a lump sum check for $82.5 million by the beginning of next month. Over the last three years, DePaul and McPier have worked closely behind the scenes with the intention of a fall 2017 opening. While McPier has been funding the project since July 2013 according to documents obtained through the Freedom of Information Act, DePaul’s contribution — half the cost of construction — is due by June 1 of this year. 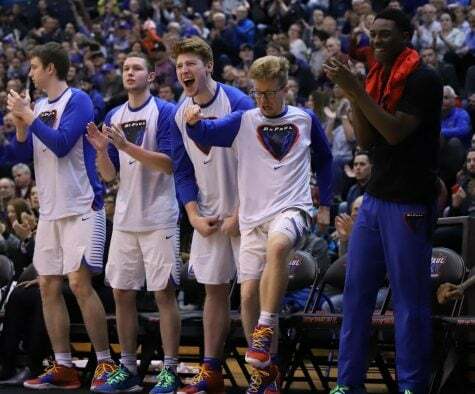 With less than a month until that date, university officials said they are on track to make their payment in one lump sum using DePaul’s financial reserves and other allocated funds. Jeff Bethke, DePaul’s executive vice president, confirmed the university’s commitment towards the still unnamed stadium. 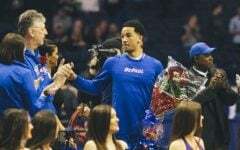 The university has always maintained that DePaul will pay for the arena using four sources of income related to the project: naming rights, corporate sponsorships, fundraising and attendance. Likewise, the school continues to reiterate that tuition and operating budgets won’t be affected by the cost of the arena. While those four income streams have not yet been secured, the university has known since the deal was submitted last year that its contribution would be due in June. Instead of taking on debt for the project, Bethke said a decision was made in November to use money that was originally set aside to pay for the new School of Music. Bethke said that the comparable cost of DePaul’s two concurrent capital projects — the new School of Music building and the upcoming arena — allowed the school to take a “convoluted approach” to paying for each with the promise of saving millions. The move will save the university between $400,000 and $500,000 a year by having the school take on debt for a tax-exempt project — the School of Music — while using cash on hand to pay for the arena, according to Bethke. While the School of Music qualified as tax-exempt by virtue of being an educational facility, the stadium is a commercial entity and therefore subject to a higher interest rate. Regarding the funds set aside for the School of Music, university officials maintained that the fundraising efforts designated for the School of Music will remain with the project. Generally, Bethke said that DePaul’s policy when soliciting funds is to “best make it an unrestricted donation” so the school has some degree of flexibility. “We want to honor the request of the donor, but we also want to have some ultimate latitudes if we need to use the money in a different way than we had the ability to do it,” Bethke said. The Office of Advancement Vice President Erin Minné said that money raised specifically for the School of Music will still go towards the original project. “The only funds being re-designated to support the Events Center are institutional funds set aside by the university from prior year surpluses,” Minné said in an email. DePaul usually ends each year with a surplus due to conservative budgeting. At the end of the 2014-15 academic year, records show that DePaul had a $43 million surplus and over the last five years has averaged a $33 million surplus per year. The budget also shows that institutional reserves have hovered around $80 million since 2011. Although the money for DePaul’s contribution is due by June 1, public records reveal that McPier has yet to near its share of the nearly $200 million project. According to contribution reports supplied to DePaul, McPier has spent only $27 million through last March. The reports track McPier’s expenditures since the project began in 2013. To date, the majority of those expenses have been construction and legal costs. The Prairie District Partners, a group of construction firms responsible for building the arena, has been paid a total of $17.8 million so far. Pelli Clark Pelli, the architecture firm that designed the arena, has earned $6.3 million. McPier also paid a series of law firms — Neal & Leroy, Mayer Brown, Katten Munchin Rosenman and Jones Lang LaSalle — for the acquisition of land, totaling $1.2 million. McPier is funding its side of the development with leftover bond funds in 2010, which was supported with local hotel and motel taxes. Asked about the agency’s spending habits, McPier declined to comment. Bethke said the university and McPier agreed upon an earlier contribution date so that the project wouldn’t be halted if McPier used up their funds too quickly. He added that it wasn’t a “huge burden” to do so. The construction of DePaul’s new arena coincides with a time of deep economic uncertainty for both the city and state. As Illinois approaches the one year mark of not having a budget, Chicago remains under the boot of a pension crisis as well as junk-status investment and credit ratings from Moody’s and Fitch, respectively. From the beginning of his first term and into his second, Mayor Rahm Emanuel has prioritized bringing more tourism to Chicago as a way of increasing city revenue and offsetting otherwise ballooning city expenses. DePaul’s new arena is one part of Emanuel’s plan to introduce an entertainment district and breathe life into the South Loop. Last year’s record tourism numbers generated approximately $935 million in tax revenue for the city, along with $124.1 million in hotel tax revenue and a new record for overnight business visitation, according to press releases from the mayor’s office. The attendees at a new stadium would theoretically fuel the demand for restaurants, hotels, and even a possible casino — the mayor has long expressed his interest in bringing one inside city limits, and DePaul President Rev. Dennis H. Holtschneider, C.M., is open to a casino near the arena, according to correspondence with McPier. Richard C. Longworth, a journalist and distinguished fellow at the Chicago Council of Global Affairs, is one of the many Chicago experts skeptical about impact DePaul’s stadium will have on the city’s economy. In a report released in April 2014, Ald. Scott Waguespack, 32nd, critiqued the arena for its potentially negative impact on the surrounding arena, such as how its development could harm surrounding businesses and similar venues. 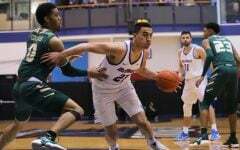 He argued that UIC Pavilion, which already struggles with scheduling difficulties, would be adversely affected by the competition the DePaul arena will create. DePaul’s decision to work with McPier and the city was motivated in part by financial feasibility; the independent construction of a similar facility in Lincoln Park could have cost the university somewhere between $350 million and $400 million, according to both Bethke and DePaul Athletic Director Jean Lenti Ponsetto. 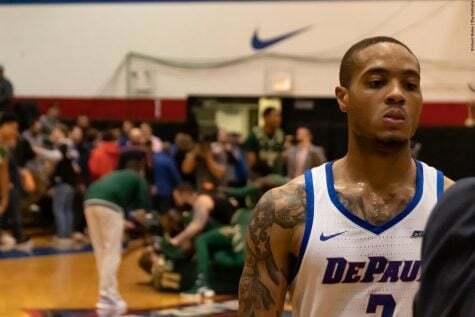 The overarching philosophy behind DePaul’s investment is grounded in the desire to rebuild its basketball program to the heights of its golden years. Lenti Ponsetto is steadfast in her belief that having a facility within a reasonable distance from both the Loop and Lincoln Park campuses on the CTA will improve attendance significantly, as well as improving the chance for DePaul to secure high quality recruits. Lenti Ponsetto also said that the facility, by being “bright-shiny-new,” will enhance the visibility and profile of the university by developing its brand. 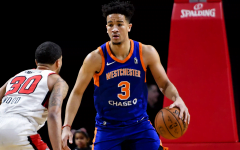 However, she also made it clear that the arena wasn’t solely an athletic initiative; rather, it emanated from the university’s “Vision 2018” plan, introduced in 2012. As DePaul prepares to change venues, university officials have been adamant that DePaul’s new deal will be better than the old. While the Allstate contract with the village of Rosemont and the new contract with McPier are structurally different — one involves the actual construction of a $200 million facility — there are also operational trade-offs that may have far-reaching implications for the university. 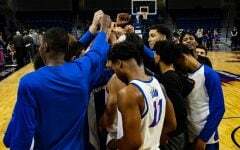 The contract between Rosemont and DePaul currently allows the Blue Demons to use the Allstate facility rent-free, while the village receives 20 percent of ticket revenues, 100 percent of concessions income and a portion of parking costs as compensation. With McPier, DePaul will pay $445,000 in annual rental payments in addition to its construction contribution. 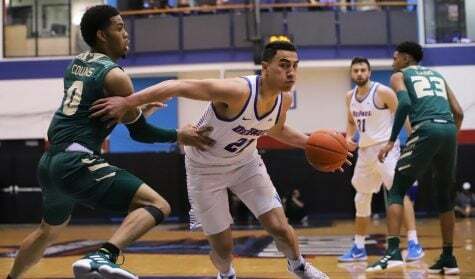 In exchange, DePaul will receive 100 percent of ticket revenues, 27 dates a year to use the facility, as well as the income from the sale of naming rights, corporate sponsorships and DePaul merchandise sold in-house. 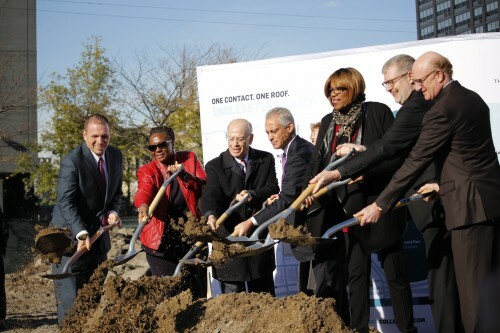 McPier will receive all revenue from concessions, 2,000 parking spaces and non-DePaul events held in the facility, according to the signed arena contract agreement from April 2015. The contract also allows McPier to retain the revenue from any surcharges on suite and club seats. There are 317 individual club seats and 22 suites in the 10,000 seat arena. 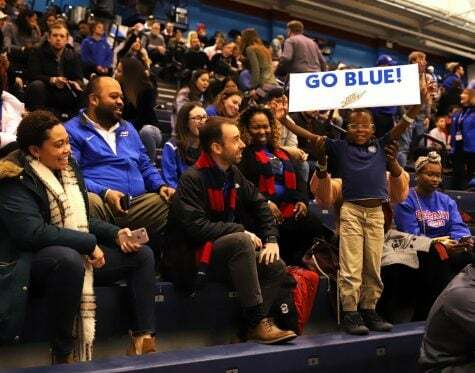 McPier will also have rights to 100 general admission tickets for every DePaul men’s and women’s basketball game to sell or use at their own discretion. The magnitude of this deal between a Catholic institution and a city-owned agency is nearly unprecedented, despite university statements to the contrary. 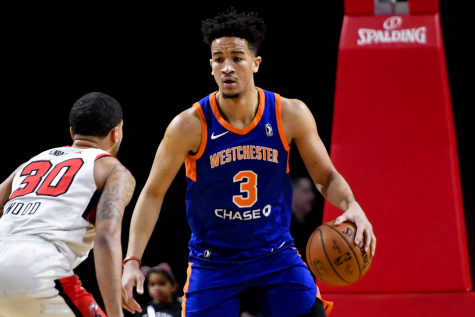 When asked if there were comparable schools that DePaul looked at for the project, Lenti Ponsetto cited two that also received a new stadium with the assistance of local government: the University of Louisville’s KFC YUM! Center, and Creighton University’s CenturyLink Center. However, closer examination reveals key differences between these cases and DePaul’s. While DePaul will be providing $82.5 million towards its new arena, KFC YUM! 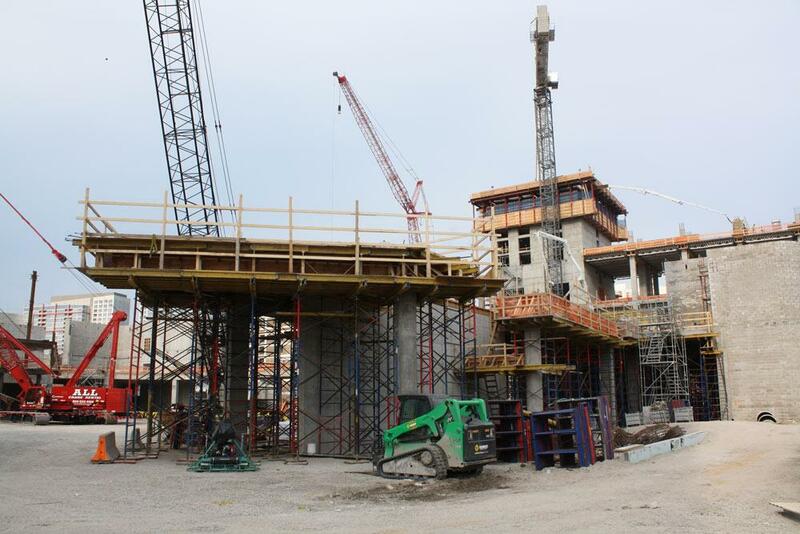 Center officials confirmed that the University of Louisville — a public institution — paid no upfront cost for the 2010 construction of its $238 million facility. Louisville instead pays either $10,000 per game or 10 percent of the gate — whichever is higher — according to its lease agreement. And while Creighton is a private institution like DePaul, Rob Anderson, Creighton’s Sports Information Director, confirmed that the Catholic university paid zero construction costs for the $291 million project in 2000, in addition to opting for annual rental payments. The only real similarity between the three schools appears to be that they’re primary tenants of their facilities, instead of owning them outright. Bottom line, these were trade-offs that DePaul was willing to make when they agreed to take on the price tag for the arena. The university viewed the value of naming rights and other income as more beneficial than their previous arrangement with Allstate. Yet with the payment due and no naming rights partner in place, DePaul has no definitive timetable on when it will be able to recoup its entire investment — let alone make a profit. Instead, this project is an investment for the long haul. 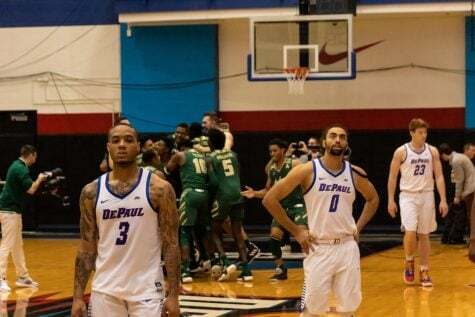 Successful or otherwise, DePaul and McPier have an agreement for the next 50 years. “I think for my part, I would like to see us be really aggressive within the next 10 to 15 years, where we have met the performer goals,” Lenti Ponsetto said, referring to benchmarks in place for the project to be profitable. “I feel pretty confident that we’re going to do that. 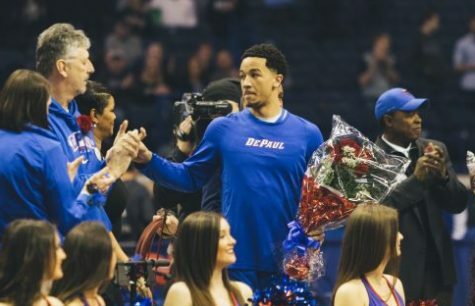 With these goals in mind, Lenti Ponsetto said that the naming rights should secure $30 million to $40 million for DePaul, while Legends Marketing — the firm responsible for signing a corporate partner — projected an income of $24 million in the leasing agreement with McPier. 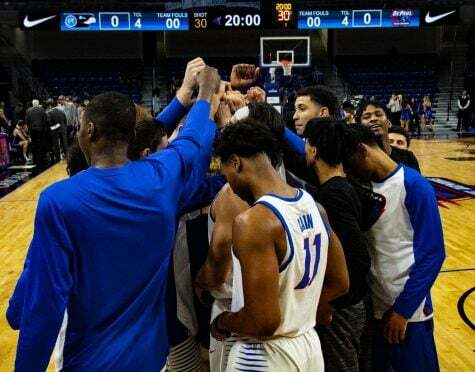 DePaul’s reimbursement and eventual benefit further depends on corporate sponsorships, fundraising and actual attendance the Blue Demons bring to their new home. Attendance documents from Allstate reveal that on average, DePaul basketball games have failed to attract even half of the 9,500 expected at the new arena, based on turnstile attendance.